Are you all ready for the Lovebird Bird Walk on Valentine's Day! 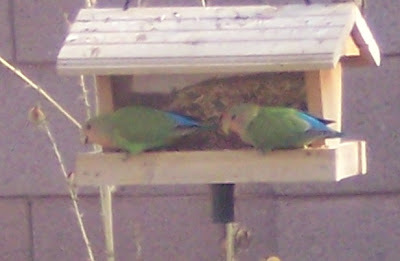 Pets are the only lovebirds of the avian types that I know of in Idaho. Native to the arid Namib Desert in western Africa, the Peach-faced Lovebird is a popular domestic bird in the United States. 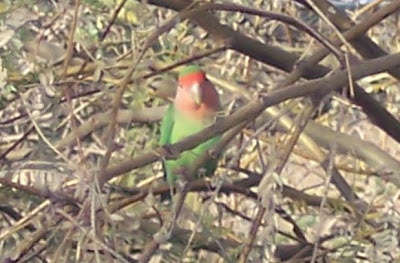 Due to the arid desert climate of Arizona there is a booming population of feral Peach-faced Lovebirds in the Phoenix metro area. I'm not sure if they escaped or if someone intentionally released them, but they are thriving in the climate that so closely matches their native climate. While I grew up here in the Treasure Valley, I did live and work for SunCor in AZ for four years. Because of the heat my kids hardly used their swing set, so I turned it into a bird feeder paradise. We had half a dozen Peach-faced Lovebirds visit our feeders regularly. They are really beautiful and we enjoyed their loud and distinctive chirps. I find it humorous to see that they sell in local pet stores for $80 a piece while I had them for the few cents worth of birdseed and I didn't have to clean out their cage, nor the long-term committment. Pine Siskins have dropped by!